Are there more Higgs bosons? 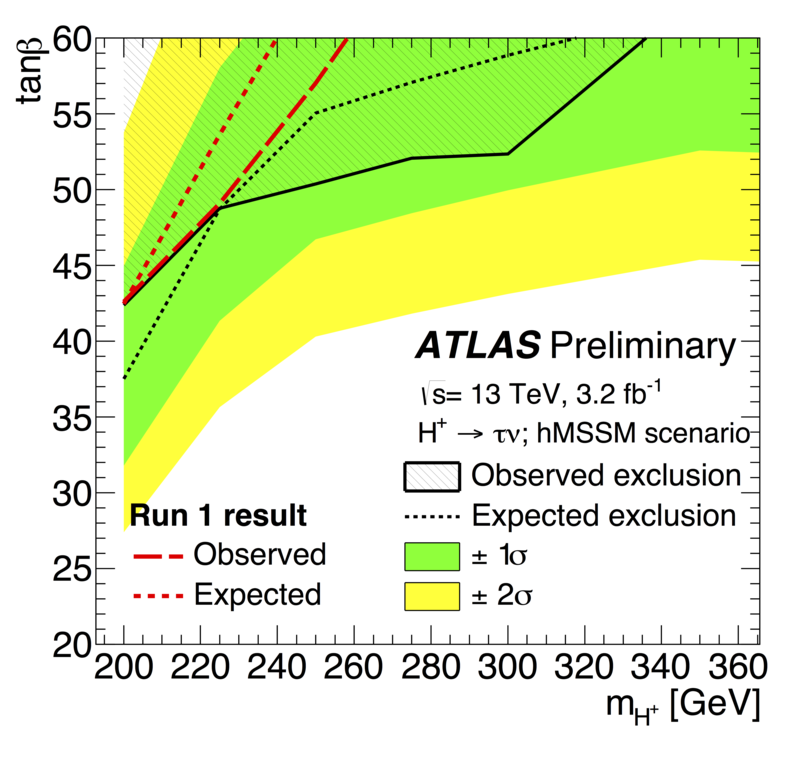 The results presented by the ATLAS collaboration during the Moriond Electroweak 2016 conference set new limits on a potential extended Higgs sector. The Standard Model of particle physics describes subatomic particles and their interactions to a remarkable degree, and the discovery of the Higgs Boson three years ago was the final missing piece. Yet there are many mysteries that the Standard Model does not explain, such as why the Universe has much more matter than antimatter or what makes up dark matter. The scientific community thus believes that there must be something more and many extensions of the Standard Model have been proposed to resolve these and other remaining questions. In the Standard Model, there is only a single scalar Higgs boson. However, many theorists suggest this could be only the first boson to be observed from an extended Higgs sector. In many models, the extended Higgs sector contains charged Higgs bosons. The discovery of one of these particles would be clear evidence of physics beyond Standard Model predictions. The ATLAS experiment has previously searched for charged Higgs bosons, but the jump in the LHC’s energy to 13 TeV could allow these new bosons to be produced in greater numbers. A new search for charged Higgs bosons has been conducted by the ATLAS Collaboration, using the data collected from 13 TeV proton-proton collisions during 2015. This search is for a charged Higgs boson produced in association with a top quark, where the charged Higgs boson decays into a tau lepton and neutrino. The fingerprint includes a tau lepton, missing energy (from the elusive neutrinos) and additional jets of hadrons from the top-quark decay. Results of this search, which were presented at the Moriond Electroweak 2016 conference, are consistent with Standard Model predictions. The results set a stronger limit on the strength of the interaction of a possible charged Higgs boson (Figure 1). With the Run 1 sensitivity already exceeded by the 2015 data, ATLAS is looking towards 2016 with excitement. As the ATLAS detector continues to record more data, the sensitivity to this search for potential new particles will continue to rise!